In the Gambia, wood resources are essential to life. Wood is constantly being used for household cooking fuel, building construction, and the manufacture of local tools. However, population growth is placing tremendous pressure on the Gambia's already sensitive ecology. With a population growth rate of 4% (amongst the highest in the world) forest lands have been denuded of their wood resources or cleared for the development of farmland. Gambian landscapes are devastated and are now only dotted with trees. This unsustainable harvest has lead to the nation-wide depletion of vegetation, threatened numerous species of wild animals, and reduced rainfall in the Gambia. Gambian landscapes are now only dotted with trees from the denuding of forests for farmland development, building materials and fuelwood. Long logs of firewood are used for fuel during village ceremonies. The heavy smoke generated poses a health hazard for the women and the babies they carry on their backs. The use of fuelwood in the home also presents a burden and a health hazard on families. The burden of collecting fuelwood is largely shouldered by women. As forest lands deplete, women are forced to travel farther in their search for fuel, often trekking up to eight kilometres or traveling by dugout canoe to collect fuel in mangroves. Fuelwood gathering must be conducted every few days as women are physically limited to the amount of wood they can carry, often shuttling it back home in bundles on their heads. Cooking methods also present serious hazards as smoke and particulates recirculate in their poorly ventilated houses and are directly inhaled by the women and children. 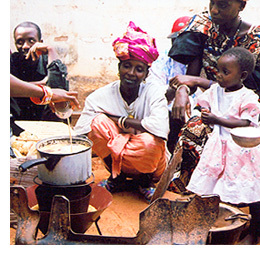 Understanding the need to relieve people's dependency on woodfuel, REAP-Canada introduced the Mayon Turbo Stove in the Gambia in September 2003. The technology peaked the interest of many women, researchers, and NGO workers as they realized its potential to eliminate the burden of fuelwood collection, alleviate indoor air pollution, and preserve the environment. Community members brainstormed with REAP-Canada staff on how to best utilize the stove to fit the Gambian lifestyle. This consultation with local villagers sparked the research, designing, and planning of bringing a larger Mayon Turbo Stove model into people's homes that is more suitable for the large cooking pots and household sizes. Field testing has shown that the stove can effectively burn selective crop residues of the Gambia including rice hull, millet husk, peanut shells, and corn cob pieces. Dissemination of the stove is being targeted towards communities where people are buying fuelwood. Additional information on the MTS can be found in the on-line library.